Jane Austen (/ˈdʒeɪn ˈɒstɪn/; 16 December 1775 – 18 July 1817) was an English novelist known primarily for her six major novels which interpret, critique and comment upon the British landed gentry at the end of the 18th century. Austen's plots often explore the dependence of women on marriage in the pursuit of favorable social standing and economic security. Austen's works critique the novels of sensibility of the second half of the 18th century and are part of the transition to 19th-century literary realism. She worked with a variety of literary forms, extensively revising three major novels, and began a fourth. 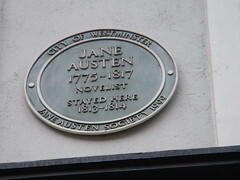 From 1811 until 1816, with the publication of Sense and Sensibility (1811), Pride and Prejudice (1813), Mansfield Park (1814) and Emma (1815), she achieved success as a published writer. She wrote two additional novels, Northanger Abbey and Persuasion, both published posthumously in 1818, and began a third, eventually titled Sanditon, but died before its completion. Her novels have been rarely out of print, although they were published anonymously and brought her little fame during her lifetime. 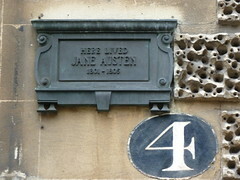 A significant transition in her posthumous reputation occurred in 1869, fifty-two years after her death, when her nephew's publication of A Memoir of Jane Austen introduced her to a wider audience. Austen has inspired a large number of critical essays and literary anthologies. Her novels have inspired many films, from 1940's Pride and Prejudice to more recent productions: Sense and Sensibility (1995) and Love & Friendship (2016). 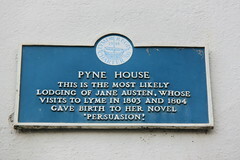 Pyne House. 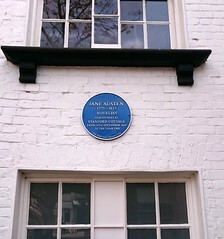 This is the most likely lodging of Jane Austen, whose visits to Lyme in 1803 and 1804 gave birth to her novel "Persuasion". 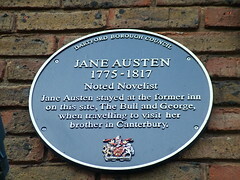 Jane Austen 1775 - 1817 Novelist stayed here at Stanford Cottage from 18th September 1805 to the year end.